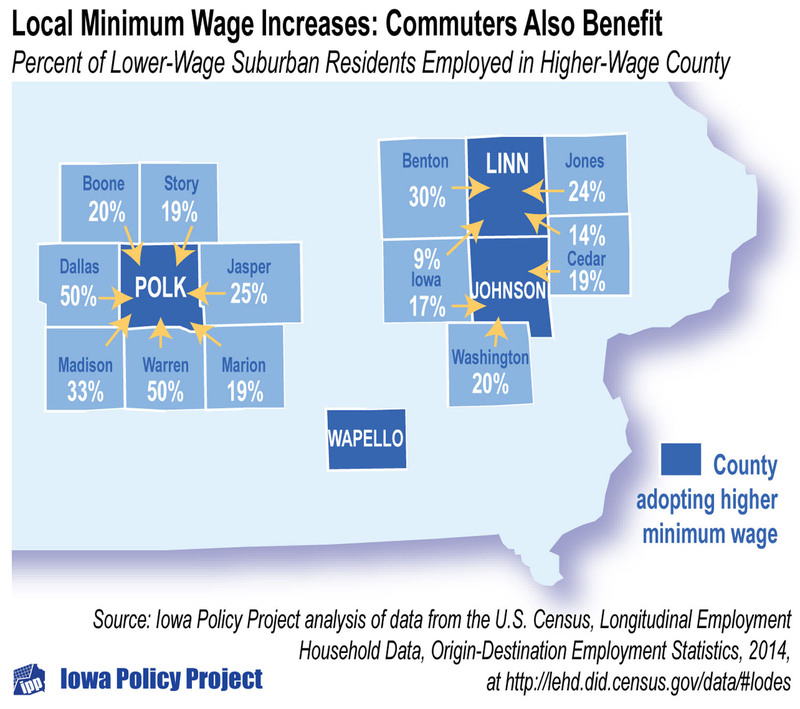 Clearly, any action by the Iowa Legislature to roll back county minimum wages would harm workers and local economies in many of Iowa’s most populous counties. It’s not just four counties that benefit from the higher local minimum wages that go into effect this year. Those four counties — Polk, Linn, Johnson and Wapello — account for a third of all private-sector jobs in the state. And a large number of people holding those jobs live in neighboring counties. Polk, Linn and Johnson counties are the hubs of metropolitan areas, surrounded by counties where a sizeable share of the workforce commutes to the hub. Those commuters earn higher wages thanks to the county supervisors in the three counties. And they come home to spend those higher wages at local gas stations, restaurants, grocery stores and other retail shops. They hire local plumbers and builders and electricians. In all, at least 12 counties in addition to Polk, Linn and Johnson will see a substantial increase in resident incomes and local purchases as a result of those three county minimum wages. The map below shows the percentage of lower wage workers in each suburban county who are employed in the hub county with the higher minimum wage. Clearly, any action by the Iowa Legislature to roll back county minimum wages would harm the workers and the local economies in many of the state’s most populous counties. Lower wage is defined as earnings of $3,333 per month or less. Restricting it to those earning $1,250 or less results in very similar percentages; the lower figure, however, would represent a wage of even less than the current minimum for someone working full time, whereas the county minimums when fully phased in will benefit all those earning under $10.10 (Johnson) to $10.75 (Polk), and some workers above those levels. These earnings cutoffs were the only ones provided in the Census data.